Recently, I was asked, "What do I enjoy about being a woman?" I think women have the luxury to express emotion. We can be nurturing, caring, intimate, sensitive, rational and even irrational. We can be strong and independent, but also needy and questionable. We can enjoy fashion, wear heels, and play with makeup. But, I guess the best attribute is being able to have children. In my personal experience being a girl was a blessing and a curse coming from my African American-Christian-Southern family. Plus, I was the only girl: my father's only daughter, my grandfather's only granddaughter, the only niece... I had no one the share that weight with. Yes, I was spoiled, but with that came expectations and double standards. In my early years, I thought that the only way to be a woman was to be a lady. To me, to be lady means being respectful, polite and nice (I'm sure I could use more of those qualities). But also never to question authority or society. To sit quietly in a dainty, pretty floral dress. And to have long, flowing hair. Yes, there was a saying, "Your hair is your crowning glory." Now, you know why I have short, curly hair and why you've probably never seen me in floral anything. Don't get me wrong, I had a great childhood and I love my family and that I'm from the South. I guess I am just a work in progress. I'm finally figuring out this makeup thing and have discovered the wonderful world of hair accessories. Maybe that just makes me a late-bloomer, which I kind of like. Maybe it just means that I need to do things in my own time. Isn't that the same for all of us? Then why (as women) do we give each other such a hard time (at work and in social settings)? And I have been on both sides of the spectrum. I now know that there are many ways to be woman and that's for each of us to decide for ourselves and for our friends and relatives to accept those definitions. Thanks for reading. 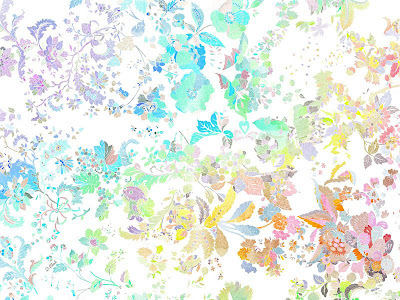 The desktop wallerpaper (above) by Deanne Cheuk is available for download via Design*Sponge.